Have a Summer Games Viewing Party! 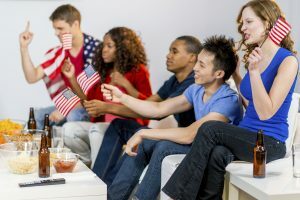 Getting ready to watch the summer games with family and friends? Why not throw a gold medal-worthy viewing party! From food and decorations to activities and favors, these creative ideas will have you standing on top of the party podium. Cone Cake Torches – Sugar cones filled with cake and topped with orange and yellow icing are a sweet way to kick off the opening ceremony. Use the pull-out star method to make the icing look like flames. For a crispy alternative, try Cheetos torches, or go healthy and create edible torch flames made with green, yellow, and orange peppers. Glowing Tea Light Torch Craft – Glow for the gold and get into the spirit with a tea light torch. This is an easy craft for kids made with a toilet paper roll, flameless tea light, cupcake liners and tissue paper. Gold Party Favors – With these gold-wrapped candy treat bags, everyone will go home a winner! World Flag Decorations – Use these free world flag printables and string them together to form a colorful banner. Decorate the room while helping children learn about the flags of different countries. International Drinks and Dishes – Celebrate the global competition by serving a variety of international beers or a potluck of traditional dishes and desserts from around the world. Everyone loves food, even if it’s from the country of a sports rival. You could also make a Brazilian meal to honor the host country. DIY Chocolate Medals – Glue gold-wrapped chocolate coins to a blue ribbon and hand these “medals” out to your guests. Summer Games Ring Cupcakes – Use Froot Loops cereal to replicate those famous rings and turn plain frosted cupcakes into a festive summer games treat. Family-Friendly Summer Games – Hold a friendly competition of your own with games you can set up in a yard or park. Make a balance beam, ring toss, javelin throw, hurdle race, and more. Have someone “score” the participants and give the winners a prize. Summer Games Word Search – Keep kids busy trying to find the names of sports that will be featured in the summer games competition. Download this free word search printable. Blue Jello Swimming Pool – Dive into the fun of the swimming competition with this delicious dessert dish made with blue jello, licorice lane markers, and Teddy Graham swimmers. So cute, easy and yummy. Patriotic Food – Show your pride for Team USA with patriotic snacks, side dishes and desserts. Make a healthy and hearty flag 7-layer dip, an American flag fruit dessert, red white and blue pasta salad, or firecracker Rice Krispie Treats. The summer games take place August 5 – 21. Get into the fun of the competition with these great ideas that will have you partying like a champion!